Welcome to Episode #12 of the Healing Pain Podcast with Dr. Ginger Garner! What is polyvagal theory and how does it relate to health or chronic disease? Signs of safety cause our nervous system to relax. Signs of DANGER cause our nervous system to react, over react or become overly sensitive. A sensitive nervous system may lead to persistent pain and other chronic health problems. The brain constantly receives input from the outside world and has the task of deciphering safety from danger. Language is evaluated by the brain and can either assist in health or whittle down ones vitality. The language you use and hear can be a sign of danger or safety. Dr. Ginger Garner joins the Healing Pain Podcast to discuss the pivotal role of language in healing. Ginger is a doctor of physical therapy, athletic trainer and yoga therapist. Dr Garner not only provides strategies for your health but also shares her own story and challenges negotiating our health care system. How polyvagal theory relates to pain, health and disease. Why language matters in the healing process. Autonomic tone, the nervous system and its role in health and disease. The difference between homeostasis versus allostasis. The concept of safety being sovereign and its relation to health. How breath and sound affect vagal tone. Dr. Ginger Gardner, it’s great to have you on The Healing Pain Podcast. Welcome. Thank you, thank you very much for having me. I’ve been wanting yo have you on for a long time, because we’re going to talk about Polyvagal Theory and the stress response, and how we can have optimal health, and what that really means. To get started, you have a really interesting integrative background. Can you tell us a little bit about your education, your practice, and how you integrate some of these strategies? Then a patient comes back, and says, “Well no, I didn’t do anything. I didn’t do any of that home program.” Then you realized that one of the most important things is readiness for change, and if they’re not ready to change, it doesn’t matter if we have a great program, but then I continued to get more and more chronic pain referrals, because I was using yoga. Then I looked up one day, and said, and this is literal what I said, “Wow, everything that I’m doing is I’m delivering physical therapy through the lens of yoga.” Everybody that I’m seeing and getting referrals for as much as I’m driving two hours away one way to come see me is because of yoga, is that being the primary vehicle for delivery. Then that’s kind of the birthplace of where I started, which again was about 20 years ago. Then I realized over time that we needed more synthesis of the two worlds and a way to practically apply it. That brings us up fast forward into the last 25 years or so to now. I’ve been practicing probably for about the same period of time, about 25 years since 1996. 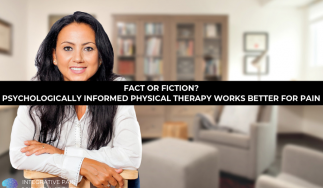 Obviously, the field of physical therapy has changed dramatically, every university program in the United States, the doctorate-level programs, so now we have doctors of physical therapy. With that, our scope is rapidly expanding nutrition really is becoming a mainstay in our practice, so there are other therapists that are having quite latch on to that because they’re still stuck in the peer-biomedical model of joints moving so to speak. The other part of that is that this obviously talks about readiness for change. There is the psychological and coaching skills that each of us need to have as well. Absolutely. In just finishing the doctor of physical therapy just a few months ago, that was a very poignant observation for me. I realized how much therapy has changed, but then they’re undercurrents and elements, which are identical to when I was getting a masters degree more than 20 years ago now. Those are the aspects of our profession, which can really stand to evolve, but not just to pick on physical therapy necessarily, because there are aspects of yoga as it being several thousand years old that also needs to evolve. Nothing stays static, right? I know you’ve done a lot of research on what’s called polyvagal theory. I want to talk about that, how it relates to the stress response, how it relates to pain, how it relates to overall health. Can you tell … On this podcast, we have practitioners as well as consumers, people seeking help with their health problems. To the consumers first, I’m trying to make this simple for them. What does polyvagal theory mean, and why is it important to their health? It’s a fancy phrase for, and this is the work of Stephen Porges, over decades. This theory is not new, but it’s reaching the airwaves now. His book on polyvagal theory was published recently in the last five years, but he has a plethora of work to back that up. The basis for polyvagal theory can be explained quite simply actually. Let’s say you’re taking a walk in the woods, and you see a cute little lizard. Now, I know there are more than one or two or three or four kinds of lizards, but to me, they’re all lizards. They are long. They have legs. It’s a lizard. You’re on a path. You see a lizard on that path, and that lizard doesn’t see you. The lizard goes on about its days, having a great time, sunning itself, looking for food, whatever it’s doing. Let’s say the lizard does see you. The lizard can do a couple of things. It can in its response see you, and perceive that it is safe. However, most lizards don’t do that. It’s a reptilian response, which is part of what polyvagal theory is based on. Most lizards will either do what humans will do. In this case, is return to their reptilian circuit of the vagus nerve or vagus circuit, and that is fight, flee, or shutdown. Some people call it freeze, but in discussing the finer elements of the theory with Dr. Porges himself, he prefers the term shutdown over freeze, but I will use the word freeze here just recognizing that what we mean is shutdown, so fight, flight, or freeze. The lizard sees you, and if the lizard is really using its brain, it will realize it really can’t fight you, so there are only two options. It will either run away, which is common, or if it perceives, and the word perceive is really important here, if it perceives that its life is being endangered, it will shutdown, freeze, stand completely still. Mechanisms will begin to shutdown. Digestion will begin to freeze or halt. Breathing stops. Same thing with a Labrador. Excited Labrador, a Retriever, if you’re a Labrador type of person, which I am, if you hold a ball up in front of that Labrador, it will be so excited, it wants to fetch. It wants to fetch. It wants to fetch. If I hold that ball up in front of my Labrador, and have the Labrador sit, and I bring the ball closer to him, he’ll stop breathing. He stops moving. He stops breathing. He’s so intent on what he’s doing. That’s a different explanation of the reptilian lizard response in the woods, but those are the three pathways essentially. They are described in two different circuits. Then it gets a little bit more complicated as far as a medical jargon goes, but if we focus on the fight, flight, or freeze response, which is the shutdown mode, then you can understand a lot more about people, everything from a physical situation to a social situation. I think, a lot of people are familiar with the fight or flight response, and I have an idea what happens to them when they’re in a fight or flight state, but I’m very curious to hear more about the freeze state, and what a person may experience in their body if they’re stuck in that freeze state from let’s say constant stress. That would be a classic definition, the latter of what you mentioned of what’s called allostatic load. I don’t want to misquote, but let me pull up this first mention. Allostatic load was first mentioned in the archives of internal medicine in 1993 by McEwen and Stellar, two researchers. This is how they defined allostatic load. It’s the cause of chronic exposure to fluctuating or heightened, basically stress, neural or neuroendocrine response. The person perceives that they have a chronic environmental challenge, or that individual reacts because they perceive the situation as being stressful, but they’re not as actually stressful. They perceive it as stressful, and that causes a psychobiological phenomenon or a snow ball effect to happen, where physiological mechanisms, our body begins to adopt to that stress in a not so great way such as HPA access dysregulation, et cetera if we put that in a separate category for now, but if you break down those three responses, fight, flight, or freeze, we would love to have an ideal response. That’s what we’re going for with polyvagal theory. We’re going for what’s called the ventral vagus circuit response, which means we perceive safety. In a single word, if that’s the only thing that someone took away from listening to us chat today, would be safety. That’s what we want. However, you got these three other options over here. Fight, flight, or freeze are all going to increase at allostatic load, and we need to be able to in physical therapy, in any branch of medicine, and in everyday life as individuals, be able to be aware when we’re going down what’s called the dorsal vagus circuit path, the reptilian response, the lizard response. Interesting. One of the things you talked about around this vagus nerve and vagal tone is you talk about language a lot. It could be language that people are talking as well as the language that they’re hearing. Talk to us about how language affects this vagal tone in our body, and how we can leverage that for our health. We don’t really achieve it. It’s the ebb and the flow of it, which is kind of like polyvagal theory. Also, sometimes we need fight or flight. The problem is when it’s sustained. That’s where language comes in. As some of you may be aware of, and as we mentioned earlier, even the creation of sound with our vocal chords affects vagal tone, so language becomes important because what we say, how we say, how we deliver it, the pitch, the timber of our voice, our volume, all of that matters, not just on our effect on other people, but our effect on ourselves. There’s an internal response to that. It affects our interoception or our ability to can self-evaluate how we’re doing from the inside-out. It also affects other people, so ultimately, all of this, I think, is driven by language. It can be therapist-driven, so there’s two ways. It can be therapist-driven as in language matters, or patient-driven as in self-talk, so our internal talk, our psycho-emotional speak but also our physiological effect on sound and breathing being probably the two greatest ways to affect vagal tone instantaneously. There’s a couple of ways we could think about it. If we’re going to talk about therapist-driven language, the importance of language that’s therapist-driven, the first word that comes to my mind is a therapeutic landscape. That’s one of the things that early on in my career, I really struggled with. I remember working in a big, 12,000-square-foot facility when people were starting to open up PT clinics inside wellness centers and things like that. I was tasked with opening up a PT clinic inside one of these big facilities. I was already using yoga at that time. Can you imagine the vagal dysregulation that’s happening inside when you got this oontz, oontz music in the background, people lifting weights, dropping weights? People are shouting. There’s multiple TV stations, and all the sound, all the sound coming through. It was very hard for me to work with patients in chronic pain that were driving that far away to come and see me when they had all these sensory inputs, and everything that we hear affects the vagus nerve and how we respond. If a person who’s in chronic pain is coming into that environment, we may have to think about extracting ourselves or changing the physical makeup of the environmental landscape in order to change the language that’s happening there, because the language in this situation is not just coming from me. It’s coming from the entire environment. That’s way too much input for that individual, so ultimately, that’s what I ended up doing is drastically changing the therapeutic landscape. Then the second thing that I also did was consider something called gracious space. This is something that I’ll talk about in the book also. The idea of gracious space was created by the Center for Ethical Leadership. It talks about being able to create a spirit of awareness that invites the stranger to learn in public. That’s a big task. A patient comes into you, where you go into a situation, and you don’t know the person. You haven’t personally connected with them. That’s not just true for parenting obviously. The way we speak to ourselves becomes our inner voice. The way we speak to our patients becomes their inner voice. Then we have the whole physiological substrate, which is, “Well, how am I speaking to my patient or my family member, or my child, and what do I sound like? Is it annoying to their vagus nerve for them to hear me speak?” Not just the content of the language, but how it sounds also, so there’s multiple layers here that you could break down to emphasize why language and safety together through polyvagal theory may be the most important thing that we do in therapy, or just in everyday life. I want to go back to what you said about not only language but also actually the voice, and tone, and sound. About a year ago, coincidentally, I had a injury of what they call the laryngeal nerve, which is a branch of the vagus nerve that innervates your vocal chords, so I lost my voice for about three months. I had absolutely zero voice. I went to see 10 different physicians, most of them ENTs and throat specialists. They did a really good job at looking at the mechanics of my vocal chords, so the fold opening closes, but what I realized after about four months of talking to them is that no one’s really looking beyond that mechanical structure, so obviously the nerve innervates with the vagus, and runs up to your brainstem, and then it runs throughout your entire brain. It got to the point where they want to actually do surgery on me, and I said, “You know, I really think this is related to stress. I had a really stressful event happened in my life, and I think it’s somehow a really maladaptive stress response.” One of the things that I found that really helped me was the chanting that I started doing from a yoga class. I actually brought it into my home, and I would do it in the morning. I noticed when I chanted or when I sang that my voice would improve, so I started to take some of those principles and apply them to myself, and my voice has now returned. They said it would never return, that the nerve is damaged, that it was probably a virus like a small Guillain-Barré that attacked me. Can you talk about how tone affects the vagus nerve, and how what I did might have worked let’s say? Yes, and I think it’s a really important fact for us to talk about, because when I first had the diagnosis, they said you have a paralysis of your vocal fold, and I said to them, “Well, I have a tiny, tiny little voice. I had a whisper voice.” I said, “So it can’t be a complete paralysis, guys. I actually saw on the screen that some of that vocal chord was moving.” I said, “So it’s not paralysis. Paralysis means that you’ll never ever going to get the function back,” so right away, I restarted trying to undo the language they were telling me because I knew that I had to be very careful about what a physician tells their patient basically. At that point, I was a patient. Granting I’m a pretty highly educated patient, I know the body pretty well in many different levels, but I had to actually back them out of saying it’s paralysis to there’s an injury there. We’re not quite sure what it is just yet, which is I think really powerful. A lot of times, especially people with chronic pain, they are told they have fibromyalgia or they have chronic pain, and that their pain is going to be chronic, and it’s never going to be healed, so right away, that starts to reintegrate your brain, or create a situation of maladaptive neuroplasticity in people. Absolutely, and there is two things that popped into my brain as you were saying that. The first was shifting the system that we’re in. We’ll go to that later, because I did want to pull in how if language is important, and safety is sovereign and also important, then what do we do with that? How do we apply that? How do we change things? One is looking at a systems change from within, inside the medical industry, big engine, big wheels turn slowly to use the cliché. If we think that we’re going to take something like polyvagal theory, and just slap it on a system that’s broken and ailing, and hurting, then we may be wrong. We may not get very far. We have to change the system wherein in order to be able to bring in these theories that are integrative and integrated, and then be able to change medicine for the future. I probably could best explain your phenomenon through sharing a story that was also a bit of an enigma for me for a long time. It’s why I sought out polyvagal theory through the channels of autism spectrum disorder and PTSD was because I couldn’t explain why, and in your case, why that happened when it looked like a paralysis, but it wasn’t, and it was maybe allostatic load due to stress and other factors that would dysregulate the HPA access, because of either a fight, or flight, or freeze situation. Here is my story. My oldest son is on the autism spectrum. Long before that happened, he was at two years old diagnosed with a rather urgent situation, where he had what’s called coarctation of his aorta. It was at two years old. It had not grown since he was a neonate, so it was creating a very damaging situation of very high blood pressure, above the head of the coarc, and very low blood pressure, where he had virtually no pulses in his feet at all behind the coarc. Obviously, that’s a rather critical coarc, and they wanted to take him in surgery pretty much right away, but there’s another detail. The day that we received that diagnosis, the previous day, he got a developmental diagnosis, not of autism because at two, you can’t really diagnose that. It’s too early. But yet it’s severe expressive speech delays and psycho-emotional delays that I at that time considered secondary to these expressive speech delays. He didn’t speak until he was almost three. The only thing that he could say was ga, so we started to teach him sign language, but there was a lot of stress there, a lot of anxiety, a lot of stress. Within 24 hours, we got these two huge diagnosis, and within a month, he was in surgery. He didn’t have. It could be maintained, and therefore, there could be that speech heart, definitely a speech heart connection that even though there’s no hard science necessarily to support it, your situation is very similar to what I just described, and that there is a reconciliation in my son’s case between cardiac impairment and the speech delays. There’s no other theory that could explain it. It offers a neurophysiological example of why he would freeze when told to go get water at a water fountain, because he had other delays also. Of course now, he’s gone on to be on the spectrum, but my theoretical statement would be how long does that atypical neural feedback loop persist in the brain? Yes, with bioplasticity, neuroplasticity, and continuing to work with him on that, could his condition have contributed to receiving that autism spectrum diagnosis now, and can we continue to improve that face-heart connection, that speech-cardiac connection to improve not just autism but anxiety, and all the other symptoms, state, trait, characteristics that go along with autism or PTSD? I think, it’s fascinating because we know the vagus nerve obviously innervates the heart, so the nerve that goes to the heart is the vagus nerve. If you have anxiety, your heart starts to beats fast. We know with a vagal episode is that when someone gets hot and sweaty and passes out basically, but some of them were subtle signs that you and I are talking about particularly the voice aspect of it. To me, it’s just so fascinating, because that could be the beginning of something or the end result of a vagal tone problem. Absolutely. When we consider how enormous that is, let’s just take parenting as an example. If we don’t understand what our sensory threshold level is, then we may be parenting in such a way that is disregarding that vagus response for that child that then grows into an adult that can have the same dysregulated response, which would be deeply ingrained by then. We know allostatic load contributes to a chronic disease, states of inflammation, and sometimes the cancer, also because that is an epigenetic effect, so the implications are enormous. We have to recognize from parenting, relational where there is a healthcare education that we have to respect that sensory threshold, and know what that sensory threshold is for ourselves and for others in order to be able to really facilitate and achieve optimal health, which is what we all want. 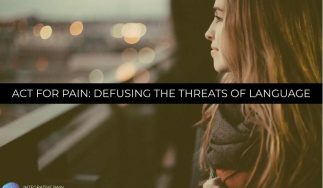 It’s fascinating, because I’ve heard many, many patients say, and there’s actually some pretty good literature about this, I heard patients say, “The pain hurts so bad. Sometimes, I lose my breath, or it hurts so bad that I can’t speak.”” I think, initially, when you first start practicing, you think, “Well, that’s just the way someone’s describing their pain,” but now that I have been practicing for 25 years, and I have been able to link the HPA access to chronic pain, now I have a much, much deeper understanding what’s going on, so when someone says to me, “My pain is so bad I can’t catch my breath, or I can’t find words when I’m pain.” Now, I already know that’s a really deep brain-body connection that’s really happening there. It is. Another example that I can think of are post-surgical patients who, let’s say … This has happened multiple times over, so I’m giving it as a general case scenario that I’ve seen a lot. They get rehabbed, which is a gift when we can get that. All patients should be getting it, but that’s another can of worms. Teaching people about exercise before they go to surgery, and [crosstalk 00:33:41]. Yes exactly. Let’s say they’re fortunate enough to get rehabbed. I’ve seen them, and which I have, and they have excellent transversus abdominis trunk function, and we have worked on those things to optimize their post-surgical outcomes. They go into surgery. We don’t know what the surgical environment was like. We don’t know what their support system was like. We don’t know how they perceive stress. Maybe hospitals are incredibly stressful for them, and it’s perceived. It may not be actual, but that doesn’t matter. Their perception is their reality, and we have to respect and honor that. Let’s say they go in, and we don’t know what all the spiritual, intellectual, energetic, psycho-emotional, social, and physical traits are that occurred around the surgery time, but I’ve seen those where they come out, and there’s no reason why there should be a complete shutdown of some of their physical functions, that the transversus is just off. The pelvic floor is off. It’s gone seemingly. Your vocal chords shut down. They’re off. They’re gone. There is no real explanation for it unless we consider and seriously think about polyvagal theory as actually being true, actually being real, and giving us psycho biological plausibility. I’ve seen that so many times in patients that I would have to say, “Okay.” It’s one reason why polyvagal theory resonates very deeply with me, not just professionally but also personally. It’s helped me be a better therapist and a parent, and certainly helped me recognize when I’m falling down on self-care too, because I’ll see those things start to crap up. Excellent. Obviously, as a doctor of physical therapy, you also are deeply enchanted to the younger world. You tach yoga and many types of courses. How does yoga affect our vagal tone, and why is it so important for people to maybe adopt a yoga program not only if they have chronic pain, but also if they’re hearing some of these symptoms of vagal tone that may be off in their body? Mm-hmm (affirmative). When I first started using yoga, just to be honest, I had no clue why I was working, really. It worked, but I wasn’t sure how. The stark honesty about it is I was using yoga without a proper therapeutic landscape in the oontz, oontz jam setting, where you hear things dropping on the floor, and all these startling noises. I was probably also not using the language that I should have been using. Even in absence of those things, where I begin to appreciate them learn and integrate it into my practice, yoga was working. Then as I began to evolve and weave more science into it from physical therapy, it began to become far more effective in even shorter amounts of time. Now fast forward into using polyvagal theory, which is the premise of my upcoming book, it’s my entry point for what I do with patients, every single one of them, how I parent, how I live. I would say we may be still don’t understand why yoga works entirely, even after writing 120,000 plus words on it, I still couldn’t give you a straight answer on why yoga works. I don’t think we understand that yet. We understand that yes, it can have an epigenetic effect. It can improve states of inflammation in the body. It can reduce allostatic load, reduce our risk of chronic diseases, help to manage pain, improve our ability to make that face-heart social connection, and engage with other people to have meaningful relationships. It can bring and has brought me out of dark places, and my patients as well, but I would say this much about it. I don’t think that the body work of just the physical yoga postures alone can be capable of achieving those positive physiological states that what’s called the myelinated vagus circuit or the ventral vagus circuit can provide. To restate that in another way, if we just flap around and some yoga postures, that may not cut it. I think, our entry points are not the body work of physical yoga. It’s obviously the mindfulness. It’s the mind-body connection, but particularly, I think it is breath and sound. Those are the two biggest entry points for why I believe yoga may work based on vagal tone. The sound part to me is incredibly fascinating. I think it’s a big part of what people miss. It is. It’s a little scary just to put it out there. I’ll just share a little story. I have grown up singing. I spent my entire life singing. I do a lot of and used to before I started this whole book, and finishing the doctorate, did a lot of jazz moonlighting. That’s something that people may not know, and grew up singing for as long as I can remember, but I also had a very traumatic, unstable childhood growing up in poverty. All the things that kids shouldn’t have to see and grow up with, that’s what I grew up with as a child. I also had some shining moments, and every single one of them are based around sound, whether it’s on a Sunday gathering around the piano and singing with the same family members that also struggled to overcome poverty and lack of education and opportunity, and trauma. We’re going to just walk into the clinic, and press play, right? We don’t know what their psychological or emotional attachments are to certain genres of music. What if you play something that triggers something, a dysregulated vagal response? What if you trigger the lizard response in them by playing music? There is a science to it. I teach and talk about that a lot dozens of hours, and how we should apply sound and what we need red flags and cautions, and things like that and general guidelines. The other thing about sound, because I’ve been doing some researching into this, is that in our society as we saw at times disconnect us from other human beings, and groups of human beings, and intimate settings that yeah, we may be connected through a computer, but one, you’re not talking or using your voice. You’re not hearing your own voice, and you’re not listening to another person’s voice as well. I think, there’s also something about the … When we talk about support and social networks, and structure for people with chronic disease and chronic pain. I think, hearing your own voice and then hearing that reverberate or bounce back from another person to you can be a really powerful thing. There are so many facets to … For example, I just gave a lecture at a symposium in Montreal back in March. I talked for I think two hours on why the voice is important. To be honest, I had to talk too fast. There’s too much information, and at the end, I had probably 20 extra slides where I said, “Oh, I’m so sorry. I can’t get to these, but that’s how important the voice is.” There are so many elements and nuances to how we can use the voice to be more effective in public speaking, and of course through vagal tone as well, that it’s fascinating to me. I think that that’s one of the areas in moving forward that I’m focusing on in the book, but also as an alternate entry point for affecting allostatic load for people is moving through sound and music, and the voice rather than, let’s say, if they have a pelvic floor dysfunction because I work in women’s health, also is I don’t necessarily need to touch the pelvic floor. Sometimes, I don’t even need to address the pelvic floor. I actually need to go up here, and I need to look at the voice first because if all of these diaphragms are connected, and they are in reviewing the literature, there are some amazing findings, a lot that I’ve learned there. Because they are connected, it really changes what women’s health would like, what men’s health looks like, and if someone, and I see a lot of hip labral injury which is another hot topic lately, femoroacetabular impingement and hip labrum problems. It may not necessarily be … The problem may not be there through regional interdependency. It could be up here in this first diaphragm, which may be in the years to come, it may become the most important diaphragm. You and I can talk about this for hours, because it is a fascinating topic. I’ve been through it personally, so it’s great to hear someone else reiterate some of the research that’s out there as well as starts to make those connections, because this is the topic that is so new, that people can start to make these connections. Dr. Ginger Gardner, please tell us how people listening and viewing this can learn more about you. I know you have a great book coming out, and you do lots of training for professionals. I do. My heart is definitely with healthcare and healthcare professionals particularly with rehabilitation professions. That’s what I spent the last 16 years doing is writing course work continuing education on integrative techniques that are largely yoga-ically driven for healthcare professionals. If you want to find out more about that, you can go to proyogatherapy.org. There is an entire training program based on yoga delivered rehabilitation, which can also include bedside care and nursing and medicine also, not just rehab. I also like to create change, and help people find their best self and be their best self through giving away a lot of free stuff. I do that through GingerGardner.com through videos, and podcasts, things like this, and a lot of blogs. I have four different blogs, which are based on women’s health advocacy, one is called Yoga Mom. One for hip and pelvis, because there are so many people with hip pain that is being misdiagnosed or missed for years on end. That’s called Yoga Hippie. Then I have two more, one that’s on yoga harmony, which is exactly what we’re talking about today, yoga sound, and then yoga prescription which talks about how we can use yoga prescriptively across around of not just conditions, but also prevention and for all different kinds of healthcare pros. Then a little thing, the book is coming out, which has been about three years in coming for me. That’s called medical therapeutic yoga. The website will be up soon. It’s medicaltherapeuticyoga.com. Of course, you can find me on Twitter, Pro Yoga Therapy, and Facebook under Professional Yoga Therapy Institute. That’s the school for therapeutic yoga that I founded 16 years ago, and also my name, Ginger Gardner. I think that gives them many different ways to get in touch with me, but I always leave one out, so I hope that’s good. That is a plenty of avenues. When you have the link for the book, I’ll put it on this page, so I can access it. I want to thank Dr. Ginger Gardner for being with me on the Healing Pain podcast. It’s a really, really interesting that we probably need to do another whole podcast or maybe a couple podcasts on. Thanks for joining us on the Healing Pain Podcast. Please stay connected each week at www.drjoetatta.com. Sign up for the newsletters so you get updates on each interview because I publish them each week. You’ll be able to access them on your computer, on your smartphone, wherever you listen or watch podcasts. We will see you next week. Dr. Garner is a veteran therapist devoted to helping people overcome trauma and pain. She has spent her career using yoga as therapy and training health care professionals to use yoga for both medical and self-care. Dr. Garner is the founder of the Professional Yoga Therapy Institute, an international, interdisciplinary medical yoga therapy certification for health care professionals. Dr. Garner serves at multiple universities, lecturing, consulting, and conducting research to integrate therapeutic yoga into medical education and patient care. She maintains an international speaking schedule as a course developer and educator and is an advocate for equal rights in, and access to, biopsychosocial-driven healthcare via improving health literacy for use of yoga in wellness and medicine, particularly for fostering gender equity in healthcare, improved access to physical therapy, and social justice for mothers. Ginger lives with her husband and three sons in the United States. To learn more about Dr. Garner visit www.gingergarner.com. Don’t miss the next episode of the Healing Pain Podcast! Sign up for the latest episode at www.drjoetatta.com. A community for both practitioners and seekers of health. A free resource describing the least invasive, non-pharmacologic methods to heal pain. A resource for safe alternatives to long-term opioid use and addiction. A catalyst to broaden the conversation around chronic pain emphasizing biopsychosocial treatments. A platform to discuss pain treatment, research and advocacy. If you would like to appear in an episode of The Healing Pain Podcast or know someone with an incredible story of overcoming pain contact Dr. Joe Tatta at support@drjoetatta.com. Experts from the fields of medicine, physical therapy, chiropractic, nutrition, psychology, spirituality, personal development and more are welcome.Love the show? Subscribe, rate, review, and share! 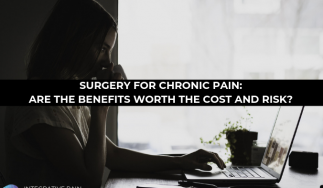 Surgery for chronic pain: Are the benefits worth the cost and risk? FREE TRAINING FROM RESPECTED PEER-LEVEL EXPERTS, STRAIGHT TO YOUR INBOX.